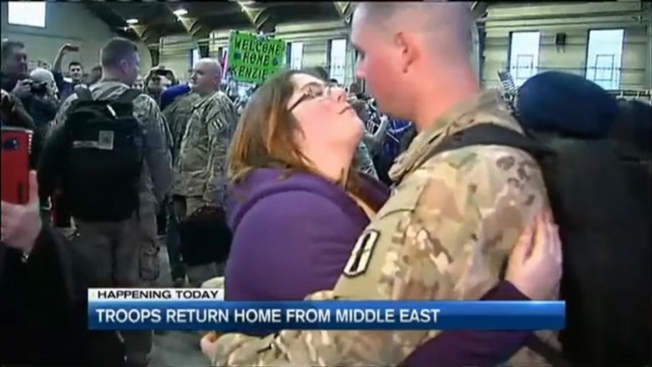 Guard Members Welcomed Home in N.H. Excited friends and relatives gathered at the Manchester Armory in New Hampshire Sunday when, after nearly a year away, 115 National Guard members made their way home for the holidays. Families first learned of their scheduled return two weeks ago -- an unexpected holiday gift for families anxious to reunite with their loved ones. The guardsmen, members of the 3rd battalion, 197th field artillery regiment, left for the Middle East in February to support Operation Spartan Shield. "I'm so anxious, so anxious, and so happy to be home and not have it be quiet," Jesee Paquette of Keene told necn. "I've been super anxious, I've never cleaned the house so many times before," Thea Dionne of Rochester said. "I've been so anxious, and so excited to have him home finally." Soon, that anxiety turned to a swarm of hugs, kisses and tears of joy. "It's very overwhelming," New Hampshire National Guard member Jalesa Tuttobene said after greeting her family. "I don't think I prepared myself enough so coming and seeing all these people who are here for us, it's very heartwarming." Unfortunately, not all of the National Guard members who deployed in February returned today -- their families will need to wait a few more months before their return home.